As an English teacher and literature major in college, I am passionate about the English language. I am a self-identified stickler for grammar, and I will correct a text to a friend if I notice it lacks an apostrophe or contains an erroneous punctuation mark. But by no means am I an expert on everything there is to know about English. In fact, I have realized how little I knew when I started teaching English as a Foreign Language this year at an Italian high school in Italy. I teach across a range of ages and abilities, but studying grammar is common among all classes. And I have been asked many times to prepare exercises or speaking activities for topics like the present perfect versus past simple, or contexts that call for the present continuous. Until now, I never learned what the present perfect was, nor did I know the difference between that and past simple or when to use the present continuous. Of course, implicitly, I know all of these rules from learning English as my first language and from studying it in school. But never had I learned the labels for these verb tenses or the explicit reasons for differentiating between one and another. Now, in teaching these aspects of the English language, I am also relearning them from the perspective of my non-native English-speaking students. What follows is a summary of the basics of each English verb tense as non-native speakers commonly study them. Non-native speakers of English often learn verbs in three basic parts: the present, the past, and the past participle. With these three parts, one can form any combination of tense. With the above verb to write: the present is write, the past is wrote, and the past participle is written. Below is a summary of how to form and when to use each verb tense in English. The present tense in English is fairly simple. It comprises the verb as it appears in the infinitive (the "to" form, as we learn it in foreign languages). We use the simple present to describe a current condition or action in general. I write for the New York Times. She rides her bike to school every day. The present continuous could be referred to as the "-ing" form of a present tense verb. It is used to describe an action that takes place in the present and is still ongoing at the moment it is being described. It is formed with the subject + form of to be + present participle. NB: The present participle is the stem of the verb + -ing. The stem is the part of the verb that is common to all other variant forms of that verb (the infinitive, the present, the past participle, etc). The stem of the verb to write is writ, to which we add -ing for present continuous. She is reading her favorite book. We are playing a board game. They are laughing at the TV show. It is not raining right now. I am working as a teacher. This week in science class, he is studying genetics. I am travelling to Sicily next week. My friends are getting married in three months. The past tense has several different degrees of past. In the past, the verb does not change depending on the subject it follows. Regular verbs form the past tense by adding -ed to the end of the present tense form, as in play à played, talk à talked, work à worked. In the case of a regular verb like to talk, the past is the same as the past participle. à talk (present), talked (past), talked (past participle). To write is an irregular verb because the past is not formed by adding -ed to write (it is not writed), but it is more conducive to showing the difference among the three basic verb parts. The past continuous is what other languages, like French, Spanish, and Italian, call the imperfect. It indicates an action that took place in the past over a continuing period of time, an unfinished action. I was watching a movie. We were driving to practice. The kids were studying for their test. Usually the past continuous is used soon before or soon after the past simple. In this scenario, it describes a continuing action in the past that was happening before another finished action happened. I was watching a movie when you texted me. We were driving to practice when the coach called to cancel it. When the teacher entered the room, the kids were studying for their test. In the above scenarios, the action following the word when is in the past simple: it is a complete action that happened in the past. The past continuous describes the preceding situation, the condition that was ongoing up until the point of the completed action. The name may sound misleading, but the present perfect tense is used to talk about something that started in the past and continues to be true in the present. I have seen this movie twice already. So far this week, I have eaten pasta three times. She has played piano since she was a child. We have lived in Boston for five years. We have not yet ordered our food. In this last example, the present perfect refers to something that is not yet complete, but the fact that it is not complete applies to the recent past in addition to the present moment. Follow this link from Education First for a more extensive list of situations in which we use the present perfect. There is a subtle but distinct difference between the present perfect and the present perfect continuous. The present perfect continuous is used in many of the same situations as the present perfect, but its function is to emphasize the process or the ongoing progress of the action and not just its end result. She has been hanging up posters all over town. They have been trying to get in touch with you. We have lived in Boston for five years. vs. We have been living in Boston for five years. The effective meaning is the same, but the latter (present perfect continuous) underscores the fact that we have lived in Boston for five years already and we are still living in Boston now. Compared to the simple past, which describes a completed action at a specified time in the past, the past perfect describes a completed action that is even more in the past. In other words, the past perfect happens before the simple past, but both are already completed actions that happened in the past. The first day of school had finally arrived. I realized I had met her before. (I realized = simple past; I had met her = past perfect). à Some time in the past, I realized that another time farther in the past (even longer ago) I had met her. The rain had stopped by the time the game started. à When the game started (at a specific time in the past), at some point before that time, the rain had already stopped (farther in the past). Much like the present perfect and present perfect continuous, the past perfect has a continuous counterpart. It is formed with had + been + present participle. They had been taking lessons for six months before they performed their first concert. We had been planning to go on vacation in July, but we found a better rental in August. Had you been studying French a long time before you decided to attend a university in France? Again, it might sound like an oxymoron, but the future perfect tense is actually a form of the past. It is used to talk about a completed action (past) but at a future point. It describes a time in the future, from which one can look back at an action that, at that point will already be complete. It is formed with the future will + have + past participle. By the end of this year abroad, you will have travelled to six different countries. When you get here, I will have finished my homework. Once I pass my last exam, I will have completed every level of certification. Note that in the last two examples, the first verb is in the present, and the second verb is in the future perfect. By the end of June, I will have been teaching for one whole year. At midnight, we will have been dancing for five hours straight! 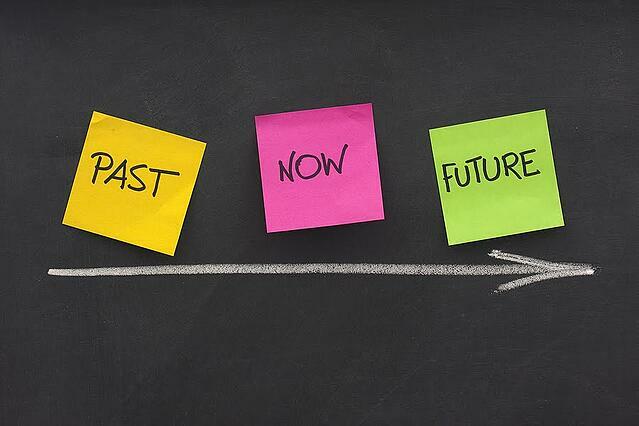 To talk about things that have not yet happened, use the future tense. The future tense refers to actions that have not yet been completed. They will occur at a later point from now. My brother will pick us up after school. The waiter will bring the food in a moment. Will you be able to make it to the party? The future continuous is used for actions that will be completed in the future over some duration of time. It is formed with will + be + present participle. You will be laughing so hard when you see the new comedy. How many days will you be staying at our hotel? There are several different types of the conditional, which I have previously explained in a former blog post. But the one that introduces a new verb form for the purpose of this post is the present conditional, which uses would, to express a hypothetical or uncertain situation. It is formed as an "if "clause, to express what would be the case if a currently not-real scenario became the reality. If I ran six miles a day, I would get in shape. If I ate more fruit, I would be healthier. We would get better grades if we studied more. For a comprehensive guide of all verb tenses and combinations thereof, look at the EF verb pages here.